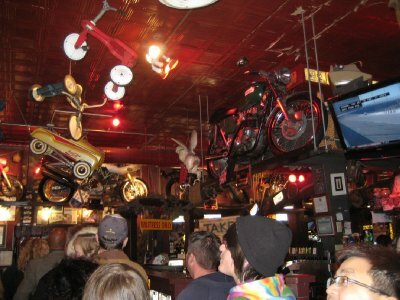 On a Friday night back in 1964, a gang of friends arrived at the Anchor Bar at 1047 Main Street in Buffalo, New York. The gang was friends of the owners, and they were hungry. Dominic Bellissimo, the owner, asked his mother Teressa to fix them something to snack on. Teressa was about to make some chicken stock, and had a plate of chicken wings she was about to toss into the pot. Instead, she threw the wings into the fryer, and then put some hot sauce on the wings to flavour them. 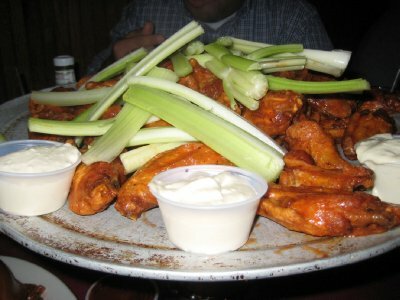 The group agreed the wings were very good, and soon the word spread about the new snack. Dominic and Teressa had invented the Buffalo wing. After leaving Belize behind, I headed up to Toronto to visit family and friends. This included a impromptu bachelor party in Niagara Falls, Ontario - site of casinos, bars and ... ummm... other things that men might do on a bachelor night. 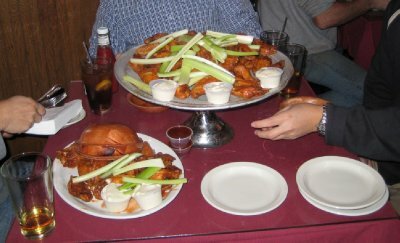 The next day, after a good nights rest at the Sheraton On The Falls hotel, we decided to head over to Buffalo to get some of the Anchor Bar's Buffalo wings. 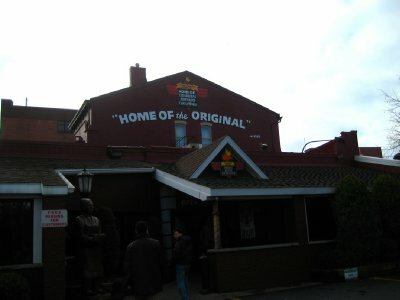 The Anchor Bar is now famous for its wings, and the place is often jammed. We arrived just before the restaurant opened, and there was a 30 person line up. The line moved quickly, though, and we were soon inside and ordering a bucket and a double order of wings. 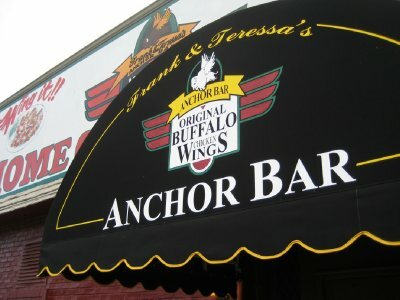 It was my first time at the Anchor Bar, and I must say it was excellent. The food over here in London is very good, but there are a few foodie things that I miss from back in North America - Harvey's Hamburgers, Swiss Chalet chicken sauce and Buffalo wings. There are chicken wings available here in London, but mostly they are Chinese golden fried style, rather than Buffalo style. There are a few American chain restaurants that make Buffalo wings, but they aren't as good as they could be. When heading to Toronto, I knew once of the things I wanted to get was Buffalo wings. And to get them at the Anchor Bar was an extra special treat.